(iv) Name the two headstreams of the Ganga. Where do they meet to form the Ganga? (i) Any elevated area, such as a mountain or an upland, which separates two drainage basins is known as water divide; for example, the water divide between the Indus and the Ganga river systems. Ambala is located on this water divide. The Western Ghats form the main water divide in Peninsular India. (ii) The Ganga, which is over 2,500 km long, forms the largest river basin in India. (iii) The river Indus rises in Tibet, near Lake Mansarowar. The Ganga originates at the Gangotri Glacier on the southern slopes of the Himalayas. (iv) The two headstreams of the Ganga are Bhagirathi and Alaknanda. They meet to form the Ganga at Devaprayag in Uttarakhand. (v) Since Tibet has a cold and dry climate, the Brahmaputra carries a smaller volume of water and less silt in this region. (vi) Narmada and Tapi are the two peninsular rivers flowing through trough. Below are given names of a few lakes of India. Group them under two categories - natural and created by human beings. Discuss the significant difference between the Himalayan and the Peninsular rivers. Compare the east-flowing and the west-flowing rivers of the Peninsular Plateau. Why are rivers important for the country's economy? 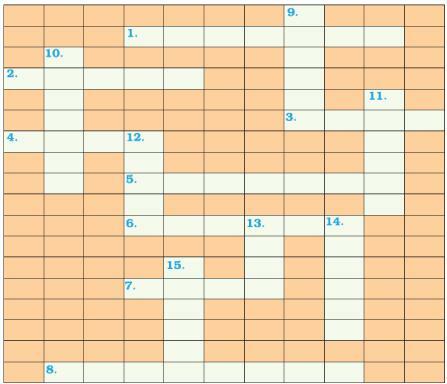 Solve this crossword puzzle with the help of the given clues. Contemporary India - Social Science : CBSE NCERT Exercise Solutions for Class 9th for Drainage will be available online in PDF book form soon. The solutions are absolutely Free. Soon you will be able to download the solutions.